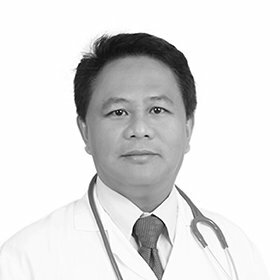 Dr. Romulo M. Dimarucut is a Diplomate of the Philippine Paediatric Society (DPPS) and has been a Paediatrician for more than 15 years. He graduated 2nd in his class in 1995 from the Pamantasan ng Lungsod ng Maynila (University of the City of Manila) PLM College of Medicine, a top performing Medical School in the Philippines. He completed his Residency Training in Paediatrics at the Ospital ng Maynila Medical Center (OMMC), a 100-bed tertiary hospital catering to the poorest of the poor in the City of Manila. Here he learned the rudiments of General Paediatrics with rotations in Neonatology, Neurology, Nephrology, Hematology, Community Pediatrics, Rheumatology, Adolescent Paediatrics, Acute and Critical Care, Preventive Paediatrics and Nutrition, Allergology and Immunology, Pulmonology, and Gastroenterology. Subspecialty exposure in Paediatric Infectious Diseases was done at the Research Institute for Tropical Medicine (RITM) and Paediatric Cardiology at the Philippine Heart Center (PHC). He started his Paediatrics practice in the Province of Cavite in 2000 where he was an active Consultant staff with the Medical Center Imus and the Metrosouth Medical Center in Bacoor. In 2005 he moved to the Kingdom of Bahrain with his family and worked as a Specialist Paediatrician with the American Mission Hospital (AMH) until 2011. A brief stint as a Clinical Associate in Paediatrics Emergency in the prestigious KK Women’s and Children’s Hospital (KKH), an 830-bed Tertiary Referral and Teaching Hospital in Singapore ensued. In 2013, he returned as a Specialist Paediatrician with the American Mission Hospital (AMH) in the Kingdom of Bahrain until his recent move in 2015 with Amber Clinics Dubai, UAE. He is very keen and perceptive in all aspects of General Paediatrics but has a special interest in Neonatology, Pulmonology, and Allergology and is particularly passionate with Preventive Paediatrics, Nutrition and Anticipatory Guidance. His approach is Holistic, which means that when you consult with him, he not only treats the acute problem but treats the child as a whole being, delving as well with the child’s other issues. He enjoys discussing his patient’s condition with the child’s guardian, making them understand the disease process and what to expect, recognizing the fact that they are integral partners in the patient’s recovery and well-being.